From Parramatta Road, take the Ross Street gates entrance into the University, you will see the ground directly in front of you. 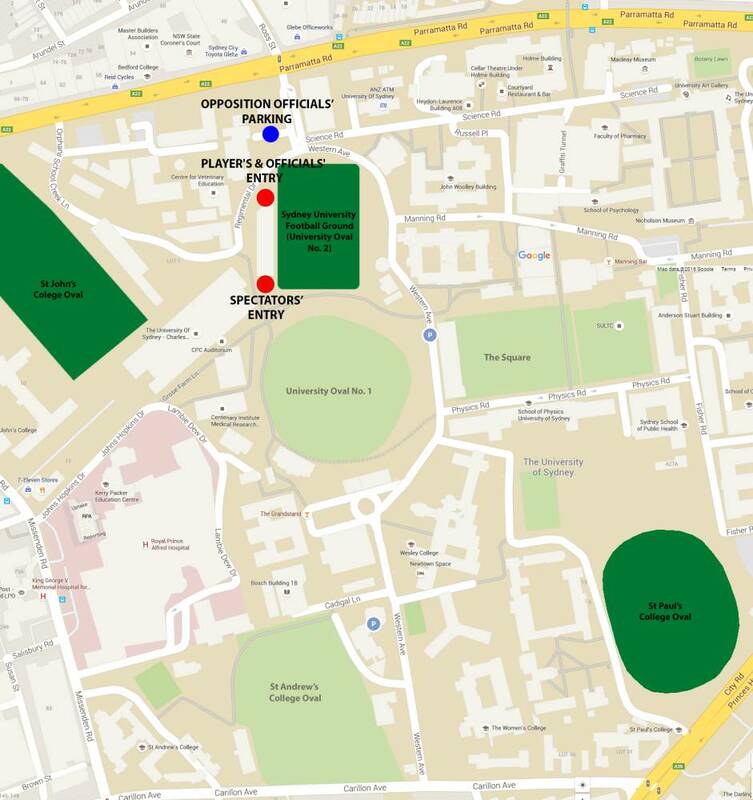 There is no free parking is available within the University grounds and you are likely to be booked for parking without a permit. 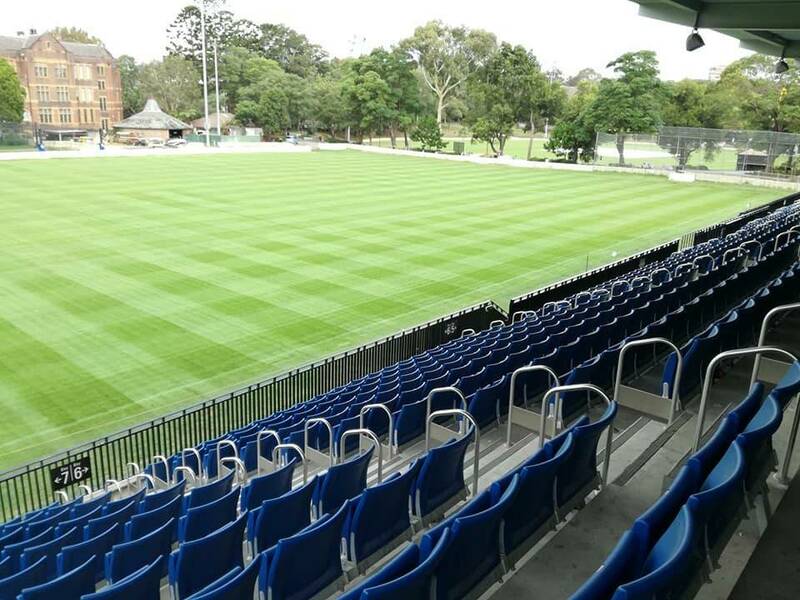 The closest parking for visitors or supporters is under St Andrew’s Oval for $6 a day. Alternatively, there is street parking available on nearby City Road and Carillon Avenue as well as in Glebe. Please note - This is subject to change during the finals series, please check the website during the week for any changes. Designated accessible parking, subject to availability. Please contact the Club before game days so we can arrange for you. All functions and events are also fully accessible to disabled people. The SUFC merchandise stand is open at all home games from 12pm until the final whistle of 1st Grade. The stand is located on the top level of the SUFG grandstand. You can also purchase all merchandise items from our online shop, items can either be posted to you or collected from the SUFC admin office, please call ahead (02935 17245) to make sure someone is available. The City Tattersalls Family area is located on the Eastern side of the ground, it will be open from 1.30pm on all match days, providing entertainment for the whole family with, Jumping Castle, popcorn machine, BBQ, Bar and seating area. The grandstand bar will open at 11am at every home game for food, hot and cold drinks and access to the toilets. The bar stays open after the games so do stick around and join the players for a post-match drink. The craft ale and champagne bar is open from 1.30pm at every game, plus the BBQ will be fired up for all the sausage sanga fans! Thanks to Vic’s Meat Market we have a huge meat tray up for grabs, pick up your tickets from the players for $2 each or 3 for $5 during the 1st Grade match, the winner will be announced just before the final whistle. Missed who scored the last point? Want to know where we are on the Shute Shield LaddeR? Download Fusesport for FREE to keep an eye on all the Shute Shield fixtures, results, competition ladders, as well as live score updates during game. You won’t miss a beat of Uni action. Simply download the application and add your preferred team by searching ‘University’. Each home game during the season will have a specific theme with entertainment tailored to suit - check out our 2018 events here. We will provide further information about each match day in due course. SUFC recognises that comments made in good spirit are part of the game of rugby. SUFC will not tolerate verbal abuse of any kind by members of the crowd towards, players, match officials or other spectators. Patrons found verbally attacking players or officials will be asked to leave the ground. Make sure you stick around after the game to join the players for the post-match entertainment held in the TAG Function Room. There will be music, live Super Rugby matches and of course a few boat races! Dress for the weather conditions - sunglasses and scarfs will be required for the Sydney winter! Grab a FREE match day program on your way into the ground for all the game day information plus exclusive player features. Families make sure you visit the family area on the far side of the field including the jumping castle, food truck and bar, you might even spot Cecil for a photo! Kit yourself out in the latest SUFC gear by taking a visit to the merchandise stand. Keep up to date with the Students on matchdays and every day via our social media pages search for @sufc1863. Entertain the kids at the half-time break by joining the big kick about on the field. Remeber to pick up your meat raffle ticket to be in with a chance to win our huge Vic's Meat try. Join the players for a drink in the TAG Function Room after the game, the perfect end to a match day at SUFG (No.2 Oval).